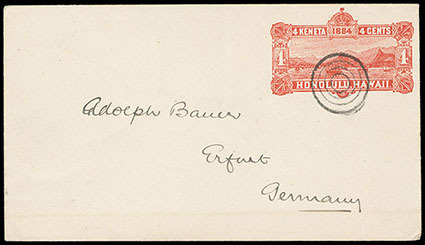 Hawaii, Envelope, 1884, 4¢ red, entire addressed to Erfurt, Germany at the scarce unsealed printed matter rate, cancelled with neat target handstamp, receiving postmark over unsealed backflap confirming usage, Very Fine, an extremely scarce use. Scott No. 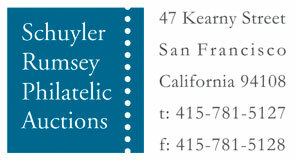 U3 Estimate $300 - 400. 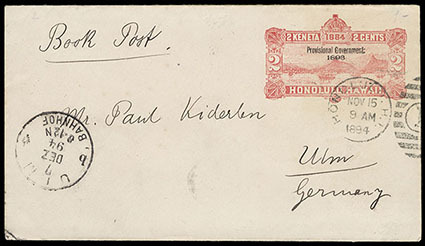 Hawaii, Envelope, 1893, 2¢ carmine, unsealed entire to Ulm, Germany, canceled by "Honolulu, H.I., Nov 15, 1894" duplex postmark, with manuscript "Book Post" endorsement and receiving cds, Very Fine, a scarce second class mail usage. Scott No. U11 Estimate $150 - 200. 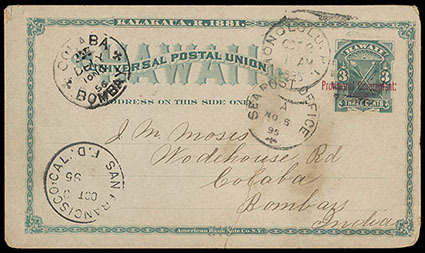 Hawaii, Postal Card, 1882, 3¢ blue green, entire to Bombay, India canceled by "Honolulu, H.I., Oct 2, 1895" duplex postmark, with San Francisco transit, "Sea Post Office" and receiving cds's; light toning and sealed tear at bottom, F.-V.F. appearance, a very scarce destination. Scott No. UX3 Estimate $150 - 200. 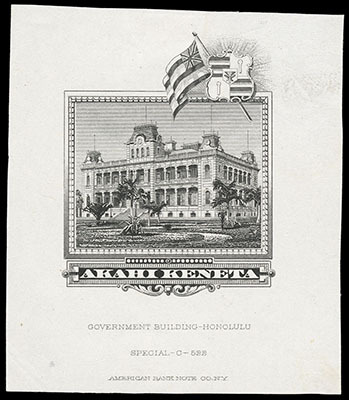 Hawaii, Postal Card, black, trial color plate proof on India, no denomination (58x67mm), with "Government Building-Honolulu", "Special-C-522" and A.B.N.Co. imprints at bottom, faint corner crease and tiny thin speck at lower left well away from design, Very Fine, an extremely rare proof, with a similar proof known bearing an altered die number. Scott No. UX8TC Estimate $2,000 - 3,000. 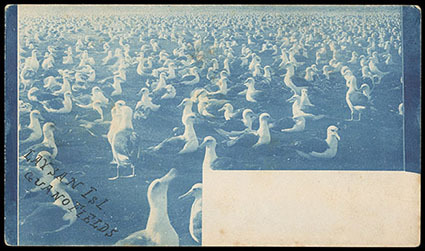 Hawaii, Postal Card, 1897, 2¢ green, larger border frame, mint entire, reverse with printed blue wash photograph of Flock of Gulls and inscription "Laysan Isl., Guano Field", some tone spots on front, otherwise Very Fine, an extremely rare printed photo picture on a 1897 2¢ postal card, only three other similar photo postal cards are recorded. Scott No. UX9a Estimate $750 - 1,000. A used example with different printed blue wash photograph image sold in our December 2010 sale (sale 40) for $2,700 hammer. 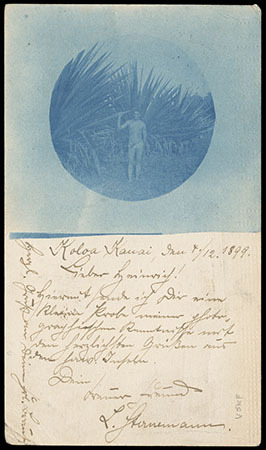 Hawaii, Postal Card, 1897, 2¢ green, larger border frame, entire from Koloa, Kauai to Germany in 1899, reverse with Printed Blue Wash Photograph of Native in Front of Fields, all proper postmarks; card with small corner crease, cut square, still Very Fine, an extremely rare used photo postal card to a foreign destination. Scott No. UX9a Estimate $1,500 - 2,000. Another used example with different printed blue wash photograph image sold in our December 2010 sale (sale 40) for $2,700 hammer. 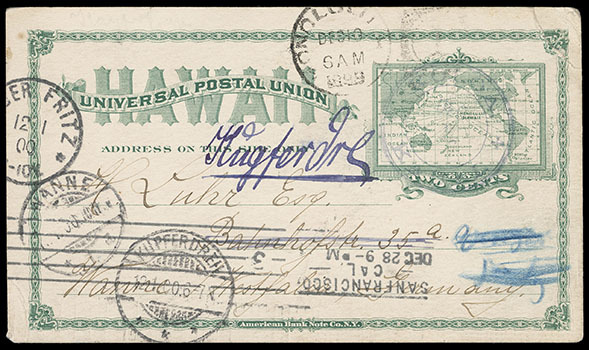 Hawaii, Paid Reply Postal Card, 1889, 1¢ greenish blue, trial color plate proof on buff card, reply card only, entire, rich distinctively greenish blue color on bright fresh card stock used for the issued cards, staple holes and small cut at bottom left, otherwise Very Fine; with 2019 P.F. certificate. Scott No. UY3rTC Estimate $3,000 - 4,000. 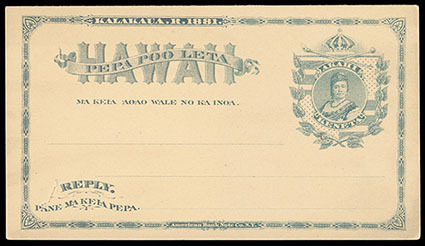 ONE OF ONLY TWO KNOWN EXAMPLES OF THE 1889 1¢ REPLY CARD TRIAL COLOR PROOF ON BUFF.